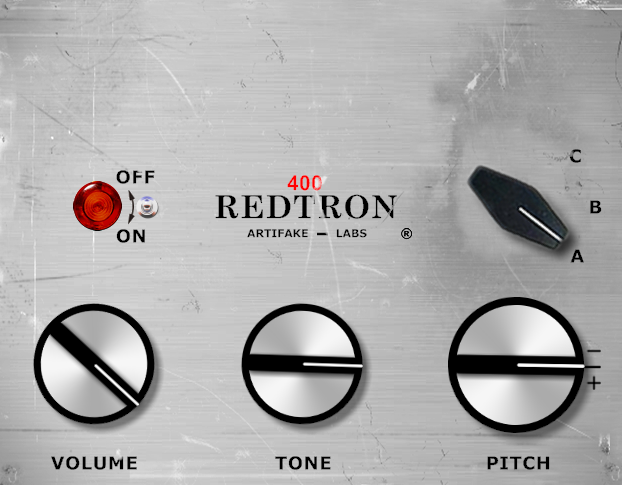 REDTRON_SE is a Special Edition of the REDTRON_400. This VST plug-in uses the Taijiguy's Mellotron samples (taken from a 1973 Mellotron M400S - Serial #500). - Nine sound types : MKII Flute, MKII 3 Violins, M400 Cello, MKII Brass, M400 Combined Choir, M400 String Section, M400 Woodwinds, M300A Violins, M300B Violin. - No loops : like the original Mellotron, each sound is eight seconds long with, in many cases, "the bad endings". - Exclusive "Mellotronic Click Switch" (MCS). On real Mellotrons, "Click" can be heard at the beginning of a note, when the tape comes in contact with the replay head. On REDTRON_SE, these "clicks " are randomly generated when you hit a key : you don't hear twice the same and they can appear on any note. A rotary knob allows you to control the effect intensity (of course, you can also completely disable it ). Note : this function is inactive when the attack parameter is set to any value different from zero. - Layer (two sounds A & B) and split possibilities (octave shift). - Volume, Tone, Pan, Tune, Reverb, Delay, Attack & Release, Octave & Note parameters. - Delay effect (Amount, Time, Feedback & Pan parameters). - Reverb effect (Mix, Width, Size & Damp parameters). 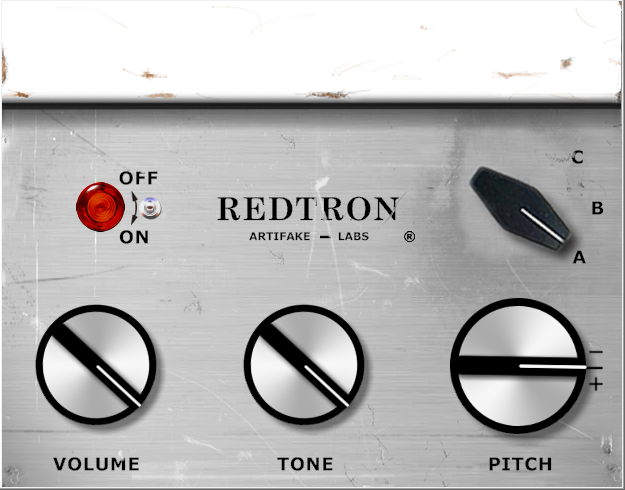 "RedTron_400 is a great little application that harkens back to the days of the Mellotron [...]. It's specific, tight, easy to use and unfussy - a plug-in (and indeed a philosophy) that many developers could learn from." 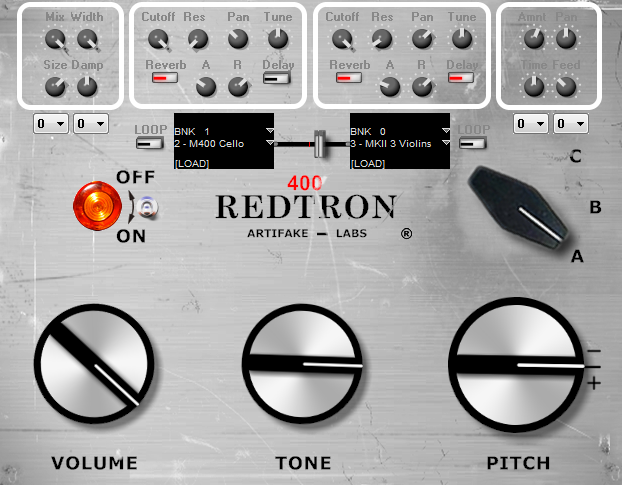 REDTRON_400 emulates the "Mellotron M400". 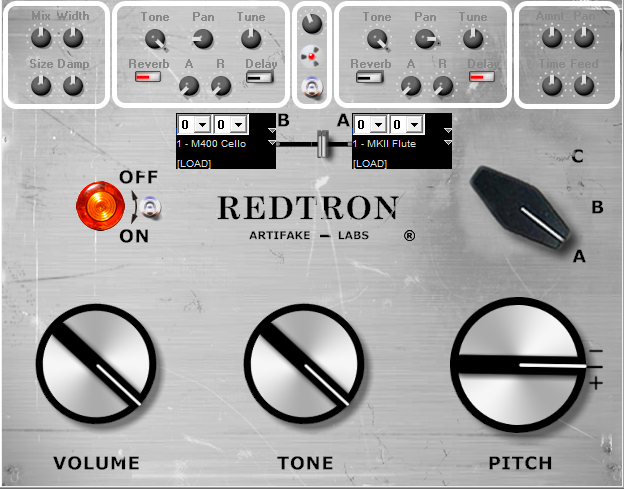 REDTRON_400 is a sample-based plug-in, made with Synthedit. - Six sound types : MKII 3 Violins, MKII Flute, M400 8-Voice Choir, MKII Brass, M400 Cello, M400 String Section. - "Loop" and "Non-Loop" modes : like the original "Mellotron", each sound is eight seconds long but you can switch to "Loop Mode" and allows the samples to loop continuously. - Volume, Tune, Reverb, Delay, Pan, Octave, Note, Cutoff, Resonance, Attack & Release parameters. - Can be used as Soundfont Player. REDTRON_MKV emulates the "Mellotron MKV" (essentially a double M400), one of the rarest Mellotron ever made. REDTRON_MKV is a sample-based plug-in, made with Synthedit. - Six sound types : 3 Violins, 8-Voice Choir, Flute, Brass, String Section, Cello. - Attack, Volume, Tone, Reverb, Delay, Pan, Octave & Note parameters. 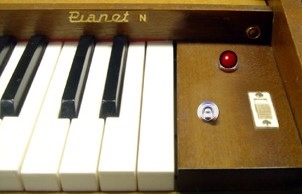 Planet_N is a recreation of the "Hohner Pianet N", an electric piano built by the Hohner company from the 1960s to the 1970s. Like the original model, there is only one parameter : tremolo on/off (with fixed rate & depth...). 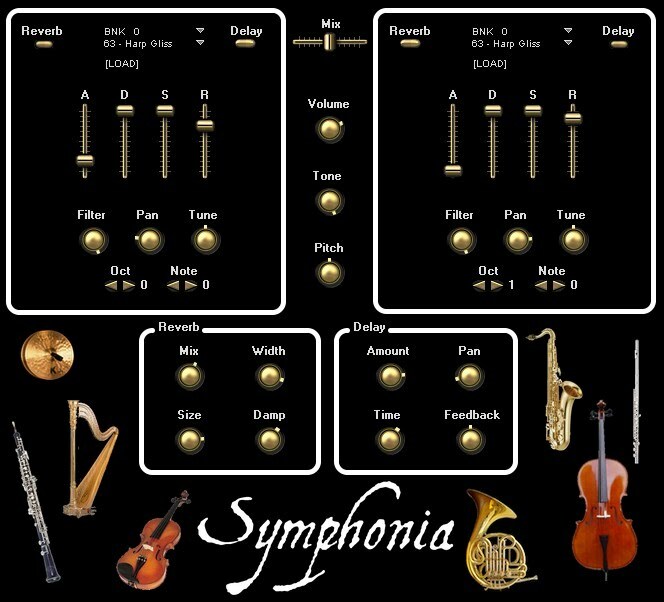 Symphonia is a sample-based module designed to reproduce orchestral instruments. It includes strings, Brass, Woodwinds (all of them with articulations legato/detache/pizzicato/tremolo), keyboards (piano, harpsichord, organ, celesta,...) and percussions. Most of the samples are taken from free soundfonts available at http://soundfonts.darkesword.com/.